No matter how much you may love your present vehicle, eventually the time will come when the cost to repair it will be more than the vehicle is worth. This typically occurs when a vehicle is maybe seven to 10 years old and suffers a major problem like a transmission failure, a leaky head gasket or a blown engine. These kind of repairs can easily cost thousands of dollars, which is usually more than your vehicle is worth. So you have to make a difficult decision: Do you keep the old clunker and keep pouring money into it, or do you get rid of it and buy something else? Nobody likes to make car payments, and nobody likes to spend money on car repairs. By the time you pay off a new vehicle, the repair bills start going up. You can't win. The unfortunate truth is that all cars and trucks eventually wear out no matter how much car maintenance we give them. Automatic transmissions should last upwards of 150,000 miles, but some may fail at 70,000 or 80,000 miles in some vehicles. Most engines are capable of going 200,000 or more miles without any major problems but others may fail sooner if they develop a serious problem such as a leaky head gasket. Tires and brakes and mufflers and batteries and clutches all have a limited service life. If you get 80,000 miles out of a set of tires, you are doing well. If you get 60,000 miles out of a set of front disc brake pads, you have done well. Four or five years is about all you can expect from a car battery. And maybe eight to 10 years for the original equipment exhaust system and muffler. Add to these things all the electronics on today's vehicles, and the odds of problems and repair expenses multiples exponentially. Some electronic modules can be very expensive to replace, and even more difficult to diagnose. Then there's the body and the interior. If you vehicle is exposed to a lot of road salt in the winter, after 8 to 10 years, you'll likely be finding some patches of rust here and there, and certainly underneath where you can't see it. Your vehicle will also accumulate little dings and scratches and scrapes from the abuse that occurs in parking lots. The interior will suffer normal wear and tear that comes with daily use, which can be accelerated by kids and dogs and sun exposure. So the older you vehicle gets and the more miles it accumulates, the more "used" it becomes, and the more you will have to spend on maintenance and repairs to keep it running. And eventually you will get socked with a major repair that will be a budget breaker. Guaranteed. 1. NEVER sell your old car or truck to a friend or relative. Why? Because you will never hear the end of it when your old car or truck breaks down, won't start or suffers any kind of problem at all. They will assume you knew it had problems and took advantage of them. It may have been running fine when you sold it to them, but no matter. Eventually it will have problems and they will blame you for it. I know. I've been there. It isn't worth the headaches or the ill-feelings. My advice is to sell it to a stranger, trade it to a dealer, donate it to a charity, or junk it. 2. If you need the money, sell it yourself. Selling your old car or truck outright to an individual will almost always net you more money in your pocket than what a car dealer will give you on a trade-in. Some dealers may quote you what sounds like a good trade-in value for your old car or truck, but they are usually making up the difference by charging you more for the vehicle you are buying. Trade-ins are easy and painless (except in the pocket), and dealers know that. If you want to know the fair trade-in value of your vehicle, go to Kelly Blue Book and look up what your car or truck is worth. Then see how the dealer's offer compares to what the average market trade-in value is before accepting their offer. Always sell a car for cash. If you accept a check (even a "certified" check), hold the title until the check clears. Don't agree to accept payments from somebody, especially a stranger. You'll never get all of your money. 3. If you are selling a car yourself, be honest. Don't try to conceal problems or lie to potential buyers. That's why used car salespeople have a bad reputation. If your vehicle has problems, the buyer will discover them sooner or later anyway, and think you tried to screw them. Remember, they know where you live. If a vehicle has a problem or something does not work, point it out to the potential buyer and let them know you are selling the vehicle "as is" and list the know flaws so they know what they are buying. Don't say things like "it just needs a tune-up." If all it needed a tune-up, wouldn't you have tried that already? If a vehicle has a lot of problems or a major problem (like a bad transmission or engine), sell it as a "mechanic's special" or a "fixer upper." You might not get as much money for being honest, but you will have a clear conscience. Don't do to others what you wouldn't want others to do to you. 4. If you are selling your old vehicle online, watch out for scammers. Do not accept bids from outside the U.S. The scam here is that they mail you a check for more than the agreed upon price, say it was a mistake and ask you to send them back the difference. Be wary of any bidder who can't pay via normal methods such as PayPal, cash, check or U.S. money order, or buyers who want to pickup up your vehicle or have it shipped before you receive payment (make sure the payment clears your bank BEFORE you ship or allow them to take delivery!). Also be aware of the fact that getting a winning bid does not always mean you have a buyer. The person may change their mind, not show up, try to haggle you down from the agreed upon price once they see the vehicle, etc. Even so, selling online casts a wider net and attracts more potential buyers than parking your car in the driveway and hanging a FOR SALE sign on the window. 5. If you don't want to go through the hassle of selling a vehicle yourself (like dealing with strangers coming to your door, people who call and never show up, people who haggle on your asking price, then can't come up with the money, etc. etc. etc. ), another option is to donate it to a charity such as kars4kids, or Wheels for Wishes. 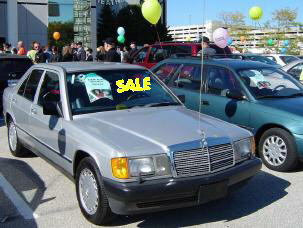 Many charities accept used vehicles as a means of generating revenue. In most cases, they have a contract with a local salvage yard who will tow your old vehicle away. The salvage yard typically pays the charity a flat fee regardless of the condition or potential value of the car (typically $100 or less). You get a tax write-off, the charity gets a few bucks, and the salvage yard makes out like a bandit by reselling any good used parts on your vehicle and then scrapping what's left. A salvage yard can easily make hundreds of dollars off your old vehicle by selling its glass, fenders, hood, doors, other body parts, interior parts, brake parts, engine and drivetrain parts, the radiator, maybe even the tires to people who need parts to fix up their old vehicles. The scrap iron value of a typical car or truck today can be $100 to $400 or more depending on its weight and current market prices. Add to that the scrap value of the aluminum parts (which command a higher price than steel), the scrap value of the platinum in the catalytic converter ($25 to $75 or more depending on the size of the converter), the value of the radiator, battery and copper wiring, and it all adds up. If your old vehicle is junk, then sell it as junk direct to a scrap dealer. Then donate the cash to a charity if you like. If your old vehicle is driveable and still has some miles left in it, don't donate it to a charity. Give it to somebody who needs transportation or who has the mechanical ability to fix it up. Junk yards make enough money, and most charities don't get a fair portion of the true value of a donated vehicle form the junkies. If you want to help out a particular charity, make a cash donation or volunteer your time.